Check out Tobi's Alice Distressed T-Shirt Dress Nothing more relaxed than the White Alice Distressed T-Shirt Dress. In cotton, the casual day dress has a crew neckline and drop shoulders with short roll-up sleeves, with small rips at the shoulders and hem for an edgy distressed look. Add booties and a moto jacket and go grab that latte. Nothing more relaxed than the White Alice Distressed T-Shirt Dress. 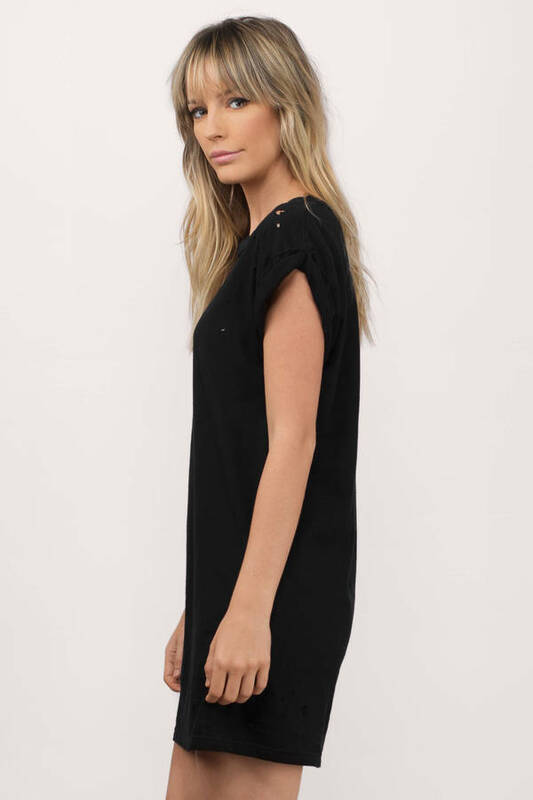 In cotton, the casual day dress has a crew neckline and drop shoulders with short roll-up sleeves, with small rips at the shoulders and hem for an edgy distressed look. Add booties and a moto jacket and go grab that latte. Nothing more relaxed than the Black Alice Distressed T-Shirt Dress. In cotton, the casual day dress has a crew neckline and drop shoulders with short roll-up sleeves, with small rips at the shoulders and hem for an edgy distressed look. Add booties and a moto jacket and go grab that latte.